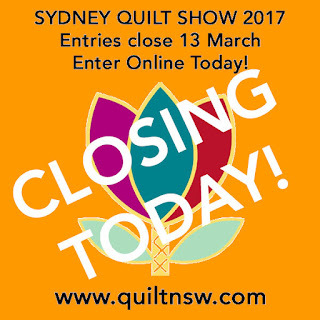 Entries for the Sydney Quilt Show 2017 close at 11.59pm on Monday 13 March. That's today! Submit your entry now via the ONLINE ENTRY FORM and pay by credit card through our secure ANZ portal. You will receive immediate email confirmation of your entry on payment. No matter what kind of quilt you make, there's a place to share it at the Sydney Quilt Show 2017. Follow the handy flow chart to help choose your category. The exhibition team looks forward to seeing your entry. Entries for Recycled, Repurposed, Revitalised patchwork-inspired homewares and furniture category close on Monday 1 May 2017.